The Great Wall of China, as seen near Beijing in March of this year. China’s first comprehensive measurement of its Great Wall shows it to be 13,170 miles long - thousands of miles longer than previous estimates - state news outlet Xinhua reported this week. The length of the Great Wall of China - actually a non-contiguous series of defensive systems involving walls, natural barriers and trenches, built from 475 B.C. to 1644 in various areas to fend off invaders - was determined through surveys that began in 2007 at the direction of the State Administration of Cultural Heritage. 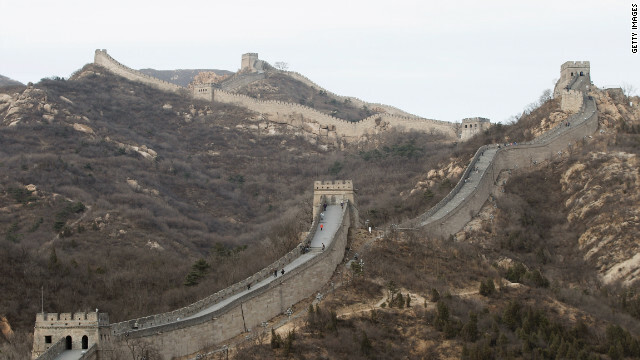 Partial results of the survey, announced in 2009, showed that the wall systems built during the Ming Dynasty (1368-1644) were 5,499 miles (8,851 kilometers) long, Xinhua reported. Teams then were instructed to identify and measure pre-Ming Dynasty wall systems throughout China. They found them to be 7,671 miles (12,345 kilometers) in length, said British researcher and author William Lindesay, who studies the Great Wall. “The figure just announced (13,170 miles, or 21,196 kilometers) is a combination of the length of the Ming plus (the) length of pre-Ming Great Walls,” Lindesay wrote to CNN in an e-mail Wednesday. The British Broadcasting Corp. reported in 2009 that before the initial survey results were announced, the wall’s length was commonly estimated at about 3,100 miles (5,000 kilometers). The new survey report shows that many of the walls are in bad shape. In some sections, only the foundation remains; and only 8.2% of the walls from the Ming Dynasty are whole, according to Xinhua. Activities such as mining and infrastructure development have damaged the walls, as have people who have taken soil or bricks from the structures, Xinhua reported, citing the report. The report said that “the saving and preserving of the Great Wall’s relics should not be delayed,” according to Xinhua. “These surveys are important groundwork in the protection of the walls, as first they need to be identified, location-recorded and measured,” Lindesay wrote in his e-mail to CNN. Not all of the 13,170 miles represent actual walls. Among the 5,499 miles reported in the Ming Dynasty section in 2009, 223 miles were trenches and 1,387 miles were natural defensive barriers such as rivers or steep hills that were incorporated into the wall system, according to National Geographic. The Great Wall of China was put on the UNESCO's World Heritage list in 1987. ......what can be done using slave labor. Oh good. Should keep those Mongols out. I was lucky enough to be able to visit and walk a section of the wall near beijing, it is incredible.. when i went i stuffed by backpack full of beers, and sat on top of a watchtower.. nobody else seem to think of this and all wanted to buy mine.. worth the trip if your able.. It's not getting bigger, we're getting smaller. If the Chinese can do this why can't we? You do know it failed to keep invaders out? We could build a wall, Duane, but you have to remember that China's Great Wall, while a magnificent achievement, was a dismal failure. It did not stop invaders. Plus, it took almost 2,000 years to build. A few years ago, when a wall on the US-Mexican border was first proposed, someone in authority (I forget who) said something like "show me a 50 foot wall, and I'll show you a 51 foot ladder". Any wall can be scaled by someone with enough determination. Also, the drug and people smugglers are using tunnels to cross UNDER the border. A wall would do absolutely nothing to stop that. Because they're willing to sacrifice untold thousands of lives in the process. It would probably be cheaper to build a tower to the moon. This great Wall of China was the national territory of China during thousands of years untill additional claims made on all the countries around it. No country from its surrounding countries ever attacked China as per history only Chinese Changez Khan attacked India hence the claims for territory for tactical victories. Boy.........Home Depot could have made some big bucks off this deal! My grand father every time used to watch YouTube comic video lessons, hehehehehe, as he needs to be cheerful always. This is quite surprising and confusing also.How can it possible.